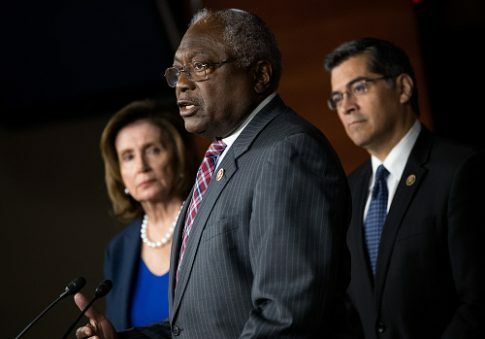 Third-ranking House Democrat James Clyburn (D., S.C.) said he would pursue the speakership if his party wins the House in the midterms and current Minority Leader Nancy Pelosi (D., Calif.) can't whip the votes needed to be elected to the position. Pelosi has confidently predicted Democrats will take back the chamber and she will try to again become speaker of the House. However, more than 50 Democrats running for Congress have declared they will not support her if elected. "If the opportunity is there I would absolutely do it," Clyburn told the New York Times. He would be the first African American speaker of the House, and he said his potential ascension would "put to bed forever the notion that the Democratic caucus is taking black voters for granted." The South Carolina Democrat said he still supported Pelosi but added he remembered a hymnal from his youth about "keeping your lamps trimmed and burning to be ready when the bridegroom comes." Such a shift wouldn't do much for the image of the House Democratic leadership as too old; Pelosi turned 78 in March, and Clyburn turned 78 in July. The point will be moot if Republicans fend off the Democratic challenge; Clyburn said in April the entire leadership team should step down if they fail to recapture the majority. A new CNN poll found Democrats leading Republicans by 11 points in a generic House ballot, and the party out of the White House typically picks up seats in the president's first midterm. Pelosi critic Rep. Filemon Vela (D., Texas) said he has a list of nine incumbents committed to denying her the speakership if Democrats have too narrow a majority. "If our majority is nine or less, then we will be in a position to force a leadership change," Vela said, although he cautioned if Democrats wipe out the GOP in November, their majority could be large enough that the politically crafty Pelosi could win regardless. Pelosi has expressed irritation with what she characterizes as a media fixation on challenges to her leadership. She criticized NBC as being on a "jag" to "undermine" her prospects to be speaker again, and she told the Times it was "perplexing" the press would be focused on Democratic power politics in the middle of the 2018 campaign. She did speak of building a "bridge to the future," a sign she envisions handing off the baton even as she battles in the moment to maintain her control of the congressional Democrats. "What I have always tried to do is build a bridge to the future, and hope that would be in the majority," Pelosi said. "If people want to be the bridge that I’m building toward, they have to show what’s on the other side of the bridge." Rep. Seth Moulton (D., Mass. ), a longtime detractor of Pelosi continuing as party leader, called for her to step aside now so Republicans wouldn't be able to use her as a cudgel against vulnerable Democrats. "It’s far better for her to graciously step down before the election, so that Republicans can’t use that attack against Democrats, than to wait until after the election," Moulton said. Pelosi once referred to Moulton and Rep. Tim Ryan (D., Ohio), who launched a failed bid for House minority leader after the 2016 election, as "inconsequential." Whatever happens in November, there will be a new House speaker. Current Speaker Paul Ryan (R., Wis.) is retiring at the end of his term, having announced earlier this year he would not seek re-election. This entry was posted in Politics and tagged House Democrats, James Clyburn, Nancy Pelosi, Seth Moulton, Tim Ryan. Bookmark the permalink.